There will, of course, be some things that cannot be reasonably fixed or might need a part that must be ordered. In these cases, a fixer will recommend the best course of action. Usually, he or she will be able to supply you with info on part numbers and repair steps so you can complete the repair at home on your own! We understand that not everyone can make it to our scheduled fairs. We still don’t want you to miss out on getting your favorite items fixed! For that reason, our “ASK A FIXER” form can be filled out with details of your broken item. A Fixer can then offer you some advice and guidance on how to make the repairs on your own time. 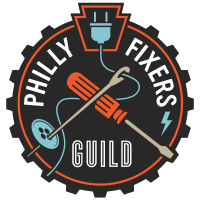 Disclaimer: The Philly Fixers Guild exists to help people repair their personal items and educate the community in general troubleshooting, diagnosis and repair. The guild volunteers are not necessarily professionals or licensed in any way. Any repair work undertaken at a fair is done as a “Good Samaritan” effort and is for educational purposes only. No repair made at a Repair Fair carries any warranty, promise of reliability, or guarantee of safety.